In the surest sign yet that SeaWorld may be swaying to public pressure in the wake of "Blackfish," the marine park publicly announced an unprecedented change in policy this week. For the past several years, SeaWorld has been anticipating the government's approval of a permit application to import 18 wild-caught beluga whales from a facility in Russia. While the application was officially filed by the Georgia Aquarium, under a breeding loan agreement with that facility, several of the whales would have ended up in tanks at SeaWorld. But the controversial plan has been mired with setbacks. The application was initially denied by the National Oceanic and Atmospheric Administration (NOAA), but the Georgia Aquarium is currently appealing that decision in court. 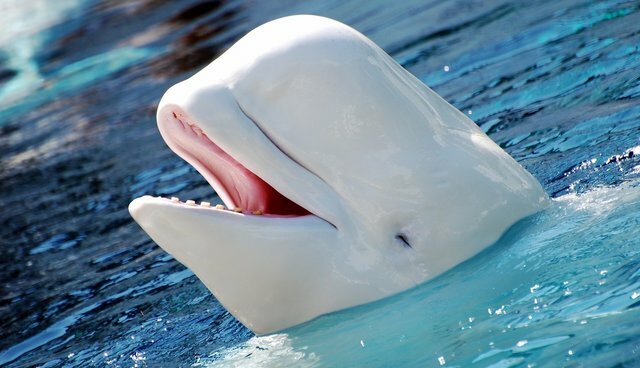 SeaWorld, meanwhile, has evidently made a 180-degree turn on its plans to accept the beluga whales stolen from the wild. SeaWorld has informed the Georgia Aquarium that we will not accept any of the belugas listed on their NOAA Fisheries import permit application. The Marine Mammal Protection Act supports the collection and importation of animals for public display in accredited zoological facilities, and SeaWorld's decision on this matter does not in any way reflect judgment on those facilities leading or participating in this beluga whale conservation effort. Rather, it reflects an evolution in SeaWorld's position since this project began more than eight years ago. What makes the announcement of "an evolution" so noteworthy is that it's a departure away from what had been the backbone of SeaWorld's business: the practice of filling its parks with animals stolen from the ocean. For Naomi Rose, a marine mammal scientist with the Animal Welfare Institute and outspoken critic of SeaWorld, the announcement represents an unprecedented shift in policy brought about by public pressure. In fact, her organization says this may be the biggest impact of the "Blackfish Effect" yet. "SeaWorld is not known for publicly admitting that anything about it was historically in need of evolution. They usually don't talk about any changes that they implement because, in their mindset, any changes they implement implies that what they were doing before was wrong," Rose told The Dodo. "For them to publicly announce on their website that not only are they changing their position on these beluga whales, but also that it is in fact a change - an evolution - in their position, is a new precedent for them." Rose believes the move is less about SeaWorld leadership having a change of heart and more a business strategy to avoid further backlash, which has been mounting in recent years. "They're not actually saying that capturing these animals from the wild is wrong, they're just saying they're not going to do it anymore," said Rose. "They're hoping people will read into it like they're doing the right thing. It's a bit of a stretch for them to argue that they are against it morally, since they signed onto the importation plan just a few years ago." In any case, however, the announcement of SeaWorld's "evolution" in this matter shows that the pillars of the marine park's business model - namely, keeping intelligent marine animals in captivity at all - could one day evolve as well, which some say it must do to stay in business. "I'm a realist, I'm not an optimist in terms of this being a sign of changes to come," said Rose. "I will believe they can change when new changes are announced."